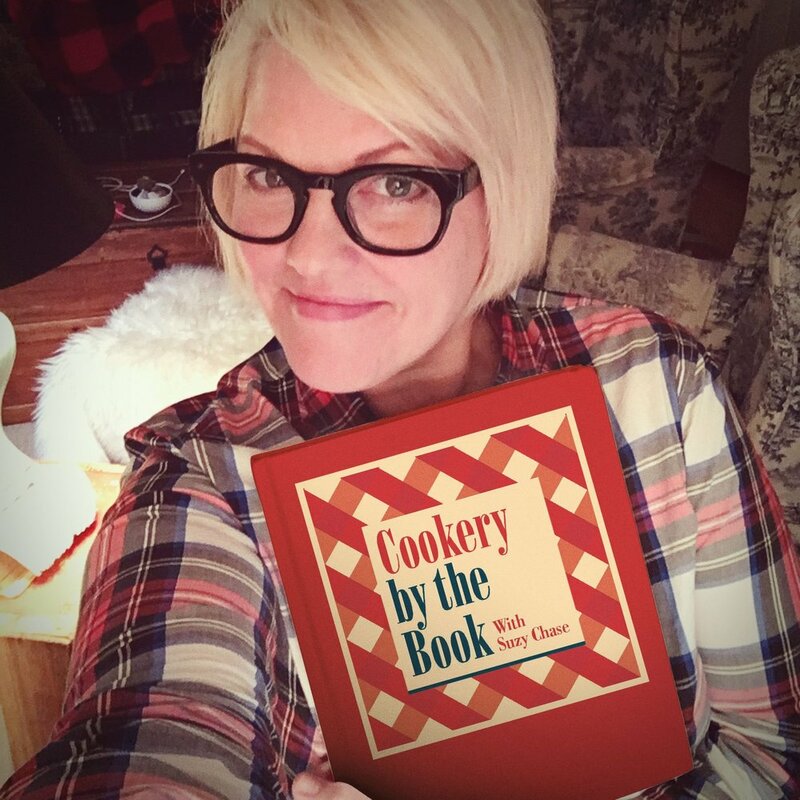 Intro: Welcome to the Cookery by the Book podcast, with Suzy Chase. She's just a home cook in New York City, sitting at her dining room table, talking to cookbook authors. Matt Hyland: Hi, I'm Matt Hyland. I'm the owner of Emily restaurant, and my new cookbook is EMILY: The Cookbook. Suzy Chase: A huge congratulations for making the "Best 19 Cookbooks for Fall, 2018" in The New York Times. So take me back to that first meal you shared with Emily in your dorm room. Matt Hyland: Yeah. So she was my RA. We were just kind of hanging out. It was a weeknight. We were both hungry, and we ordered some pizza. And we're just sitting on the floor of the dorm, eating pizza, having a good time, and having a few drinks. And like, we really hit it off, and it went really well. Suzy Chase: I read in the cookbook that at that point, Emily thought, "Wow. He's the guy I want to spend the rest of my life with." Were you thinking the same thing that night? Matt Hyland: Maybe she was looking at the pizza when she thought that. But no, I'm kidding. Yeah. We really hit it off right away. I mean, we just had a lot in common. We were in school in Rhode Island. And there wasn't a lot of people from the New York area, and we both were. So it was kind of nice to have a lot of shared experiences from the same area, and like, done a lot of the same things growing up. So, yeah. And I obviously loved her pizza, too. So, yeah. We hit it off pretty quickly. Suzy Chase: Tell me about Luca Arrigoni, and how did he become your mentor? Matt Hyland: Yeah. Luca really changed my cooking career. I was working as a line cook, and a sous-chef, and things like that, in New York City for about seven years. And then Luca opened his restaurant, Sottocasa, right across the street from where I lived. And I didn't really want to do cooking anymore; like kind of the line, sous kind of trajectory. So I walked in there. It was maybe like a day after they opened. And I was like, "I don't know how to make pizza. I don't know anything about wood-fired ovens, but I want to learn how to make pizza. And I have a ton of cooking experience." And he was like, "Okay, sure." So like, every day, I'd go in there. And you know, he'd teach me to stretch dough, and teach me to use the oven, and things like that. And within like, hours of just learning how to do it, I really fell in love with it. It's very traditional, Neapolitan pizza. It's very beautiful; like simple, really good ingredients in a wood-fired oven. And the weird thing about the wood-fired oven was, I picked up cooking on the wood-fired oven extremely quickly, because when I was young, and all through high school, I played lacrosse. And like, using a peel in a wood-fired oven is very similar to using a lacrosse stick. Matt Hyland: Yeah. These are very transferrable skills that made it really easy to cook in a wood-fired oven. I was like, "Okay." Well, I got this down in like a week or two. Stretching, of course, was a little bit harder, but using the wood oven, which usually takes a long time to master, was very quick for me to pick up. Suzy Chase: When I think about tackling pizza, I think, "Well, I don't have a wood-fired oven or fancy equipment." But one of the first things you write in the cookbook is that no fancy equipment is needed. What are some of your pro tips for making pizza at home? Matt Hyland: Well, I think having a good baking steel, or a good baking stone, a pizza stone, is really important because you can get a lot of bottom heat on your pizza. But also, there's a few tricks you can use, too. Like, if you heat up your stone or your steel in the oven, and then put it on the top shelf, right below the broiler, and then you put the broiler on; and you put your pizza on the stone that's right under the broiler, or the steel that's right under the broiler, you will create a lot of bottom heat with the steel or the stone, and a lot of top heat with the broiler. So it almost creates ... You can almost create your own little pizza oven in your home oven. So you have a ton of top heat and a ton of bottom heat, and it can cook the pizza really fast and really hot. Suzy Chase: So you have restaurants in Clinton Hill, Brooklyn, the West Village, the East Village in Manhattan, and I think you also have Nashville, too? Matt Hyland: And Williamsburg as well. Suzy Chase: And Williamsburg ... Oh, my gosh. You're everywhere. So the West Village restaurant is a few blocks away from my apartment, on a darling street. And Clinton Hill is another adorable, cozy neighborhood. Does the feel and vibe of the neighborhood play a big factor in where you're going to open a location? Matt Hyland: Yeah, definitely. I mean, these are all locations that I love. I mean, I live in Fort Greene; so you know, like a 10-minute walk from Clinton Hill. Williamsburg, I've always loved the neighborhood that we're in there on the South Side. That's just one of my favorite areas. I have family in Nashville, so that made sense. I used to also live in the East Village, or Lower East Side, a long time ago, very close to East Village. And then the West Village, that location has a very special meaning to me. I mean, as a young cook, after work, I'd always go to Blue Ribbon Bakery, and eat a duck club sandwich, and just like go downstairs, and look at that oven. And then when I found out Blue Ribbon Bakery was moving, I was like, "Oh, my God. We've got to have this space." This is like a dream space to have for any restaurateur. It's so beautiful in there. It's really like, it's a trophy restaurant, I'd call it; just like, the way the face is. Suzy Chase: Oh, totally. That location is a bit of a culinary time capsule. Talk a little bit about that wood-burning oven. Matt Hyland: Yeah. That wood oven, the Blue Ribbon guys think it's from the mid 1800s. I have a friend who's a historian, a food historian, who thinks it's probably more like early 1900s. But either way, the oven that they found, that the Brombergs found in the basement, was a communal oven. So people used to ... People did not have kitchens back in New York City, a long time ago. So they'd make their dough at home and then bring it to the communal bakery. And then the bakery would fire their homemade dough for them, and then they'd come later in the day and pick it up. So it's kind of a new thing, where like, that oven has been cooking food for the neighborhood for 100-plus years. So to get to continue using that oven to cook food for the neighborhood is really special. I mean, it's really amazing that you just get to keep feeding the neighborhood with that oven, like over and over again, for 100-plus years. Suzy Chase: I read somewhere that the Blue Ribbon guys thought it was an oven, but the real estate agent said, "Oh, no, no, no. It's a heater." So they had to track down the plans of the original building to prove that it was an oven so they could redo it, or something like that. Have you heard that? Matt Hyland: Yeah. I think the landlord thought it was a furnace of some sort. Matt Hyland: So they called ... They had a friend, I think it was a friend in Brooklyn, who was building a wood oven. So the guy who was building the oven, he was from Italy, and he happened to be in Brooklyn while they called this guy. And he came over and took a look at it. And the story is, like once he took a look at it, he gave the oven a little hug. He was like, "Oh, my God. This is amazing." And then it took almost three years, I believe, to restore it. So he would fly in from Italy. He'd crawl inside of the small opening, and restore the bricks, and do all the restoration. It took a few years. So it's a pretty amazing story. Suzy Chase: You identify the pizza at Emily as fiercely American. What does that mean? Matt Hyland: Well, you know, pizza was invented in Italy, probably. I mean, no one really knows. I mean, there's that myth that it was, you know, it's a red, white, and green dish for the Queen, and blah, blah. That's not real. That's a fake story. So it's like, it was probably invented in Italy, but it wasn't very popular. Pizza was not a popular world food until it came to America. And then, you know, New York, and New Haven, and Detroit, and all these styles of pizza are so uniquely regional. And really, Italy just kind of has Neapolitan pizza, you know? So it may have started in Italy, but once it got to America, it really took off. And I feel like pizza is an American food. It's not an Italian food. We kind of made it our own thing. So when I say it's fiercely American, it's like we make pizza here. We use our own ingredients. We do it our own style. We're not like a slave to tradition, where it has to be this; it has to be this temperature oven, it has to look like this, it has to do that. It's like, no, that's not what pizza is. Pizza is fun. Pizza is delicious. Pizza can be whatever it wants to be. I mean, a New York slice of pizza is nothing like a Neapolitan pizza. But you know, it's still pizza. So I feel that by having American ingredients, we use high-quality stuff, we don't have to adhere to tradition, that it is an American product. Suzy Chase: What is your philosophy when it comes to pizza dough? Matt Hyland: I think the simpler, the better, when it comes to pizza dough; not so much ingredients. I always like adding in whole grains. I add in some coarsely-ground rye into my flour for the wood-fired oven. That's also not traditional. I don't use 00 flour. I just think like, using local, high-quality flour is just the best way to do it. Don't overcomplicate it; just some water, some salt, maybe a little oil if you want, but just keep it easy; you know like, delicious. Suzy Chase: What does the rye do for the dough? Matt Hyland: The rye kind of gives it a nice, hearty, nutty flavor. It kind of breaks up just being a monotone, kind of white flour flavor. So it makes it nice and hearty. Suzy Chase: It's funny, when you opened your new location, one of your new locations, you knew you wanted to serve square pies. And so you figured it out it was Detroit-style pizza that you were making. How is this different from the grandma or Sicilian pie? Matt Hyland: Well, we originally were going to do a Sicilian or grandma-style pizza place. But then every time we were doing testing, the pizza was just like, "Well, what do we like about this pizza? We like that the cheese goes all the way out to the edge and caramelizes along the edge of the pan. It's called the frico crust. We like putting the sauce on top because it doesn't make the dough soggy. The cheese is like a barrier between the sauce and the dough. And we liked the size of it. Like, we take the 8-by-10, approximately 8-by-10 sized pizza are kind of a nice size for one person. And just, it really just sort of made sense. So we ordered in a bunch of frozen pizza from Detroit, had it shipped to us, and tasted it. Our pizza tastes nothing like traditional Detroit pizza. So we were kind of doing an homage to the way it looks and the way it is. But like, it's definitely not traditional. We want to use our own local ingredients. We want to use our own, like higher-quality stuff on it. So it really just was like an evolution of different styles of different pizzas that we liked and put together. And it really is just Detroit pizza. I think it's a great style of square pizza. Suzy Chase: When you decided to reach past pizza, how did you determine what other types of food would go on the menu and into the cookbook? Matt Hyland: Well, cooking is very, very personal to me. I think childhood experiences and past experience shaped the way I cook. And like most New Yorkers, I grew up eating lots of Chinese takeout and lots of pizza, so that's what I feel like I cook. Made a lot of Indian takeout, also. So it's like, these are flavors. Like, this is comfort food to me. Like, I didn't ... You know, people who grew up in the South, maybe their comfort food is like biscuits and pimento cheese. But for me, it's really takeout food. Bagels are comfort food; like, you know, smoked fish and things like that. So I want to ... You know, Emily was such a personal restaurant for me. It's like these are flavors that are very personal to me, and like comfort food to me. And that might not seem traditional, but it's sort of why I try to incorporate these kind of flavors into my cooking. And I'm also kind of tired of just having ... You go to a pizza place. It's like, "Okay, what's on the menu?" It's like a Caesar salad, and some meatballs, and some other not-very-well-made starters. So I was like, "Well, let's just try to up our offerings and make them more interesting. And even if they are something familiar, like meatballs, let's put a little bit of a spin on it, make them a little more interesting and fun." Suzy Chase: I read a 2017 article in The Village Voice that called you and Emily the first couple of New York pizza. In a town where you can spot a pizzeria every few blocks, some decades old, how did you react to that title? That's crazy. Matt Hyland: I saw that. Yeah, I was very honored. I'm not sure we necessarily deserve that. I mean, maybe by default, since there aren't really any other couples that are making pizza, I'll take it by default. But you know, there's a lot of great pizza places out there. And we're just really proud to be part of the pizza scene in New York City, and it's been so well-received. So I'm just happy that we're even talked about in New York pizza, since it's such a competitive area, and there's so much good pizza around. Suzy Chase: Yes. Speaking of competition, when you first opened your West Village restaurant, I walked by it, and I thought, "Ugh, another pizza place? Really?" Were you ever daunted at all by the fact that you can't swing a dead cat in New York City without hitting a pizza place? Matt Hyland: ... Bleecker Street Pizza. So like, we're just doing different style pizza. So that's really what it came down to, where you know, if I was trying to do some ... Like, one of my favorite pizza places in New York is John's, just two blocks away. So if we were trying to do something like John's, like a coal oven, like old-school New York pizza, yeah, I don't think I'd open there. But we were doing square pizzas, or we are doing square pizzas. And we just have a little more interesting offerings to start with than like the meatballs and things that I was talking about. But yeah, if I'm looking for a New York City pizza, like the John's coal-fired on Bleecker is like, I think that's one of my favorites. So you know, if there was another Detroit-style pizza place on Bleecker Street, yeah, we probably wouldn't have opened. Suzy Chase: With so many creative recipes and toppings in this cookbook, what would you say is the most inspired recipe? Matt Hyland: Inspired or bizarre? Suzy Chase: Well, let's go with bizarre. Matt Hyland: I think the Pig Freaker is one of my favorites. We've been making kimchi and putting some queso on it. It's sort of a combination that doesn't sound like it would work, but it really does. I feel like a lot of Korean flavors and Italian flavors go well together, and we have that in a lot of our other recipes too. Like, our wings are the Korean wings with gochujang and lots of pecorino on it; like, two things that you might not think go together well, but they do; same with the Pig Freaker with the queso cheese and the kimchi. So it's just sort of like, you know, I'm not looking at what country, or just like trying to infuse different countries. Like, it's not strictly, "This country and this country go together." It's like, "What are these flavor profiles of these different kind of neat ingredients we can put together, that work well together?" Suzy Chase: Okay. So I had dinner at your West Village restaurant on Saturday night, and let me tell you what we had. And it would be awesome if you could describe these dishes that are also in the cookbook. Okay. First, we got the Street Fair pizza. Matt Hyland: Yeah, I love the Street Fair. The Street Fair, that's another classic childhood memory of the sausage, pepper, and onion, like going down one of those street fairs in New York City; like, having a sandwich with all that. So that flavor combination's pretty classic. So that's not one of our more unique pizzas in the sense of flavor profile, but it is a very classic, a very familiar flavor that I think everybody loves. Suzy Chase: And that crunchy bit around the crust is heavenly, and you call that the frico crust? Matt Hyland: Yeah, the frico crust It’s when the cheese caramelizes along the edge. Yeah, it's really nice. Suzy Chase: So then we got the For the Nguyen pizza, and you don't really miss the sauce on this pie. Describe it. Matt Hyland: Yeah. So the For the Nguyen is a play on our hot wings that we have at Clinton Hill. We have, like I was saying, the Korean wings with the pecorino and the ranch. So we just do like a play on a buffalo chicken pizza, basically, which is a type of pizza that I love; if you want to get a little pizza-trashy. So it's the chicken, the blue cheese, scallions, wing sauce on top of it, with the radishes. So it's kind of like a fancy version of a buffalo chicken pizza, in a way. Suzy Chase: We also got the Emmy Burger Double Stack. Matt Hyland: That would be the complete and utter reason why we kind of went from a sleepy, Clinton Hill neighborhood pizzeria, to where we are now. I mean, the original Emmy Burger at Clinton Hill just, it started as me, just kind of being bored eating pizza every night after dinner. So I got some burger meat in, and I had baked some buns. And I was like, "All right. I'm just going to special a burger." And like, I kept special-ing it, and people kept ordering it and taking pictures of it on Instagram. And it went through a few different iterations of how it looks and what was on it. And then we finally settled to like, what it was. Like, people just went crazy over it. It was like, on pictures everywhere, and on Instagram, and this and that. And like, we had these two big reviews come out, one from New York Magazine and one from The Infatuation, both naming it the best burger in New York City. And Village Voice named it the best burger in New York City, and all this stuff started just coming in. And it was like, "Oh." We're like, "This is like a thing now." You know, we kind of broke that barrier of like, kind of a neighborhood restaurant, to like a destination. So we put a limit on it at Clinton Hill, so we only have 25 a night there. But we knew, when we were going to open our new restaurant, it's like we want to make sure that people can get this burger. You know, the West Village restaurant is very large. Clinton Hill restaurant is very small. So we're like, we tried to figure out a way where we could make a burger that you kind of make in some volume, and feed our guests, and have them all be happy, and not have to turn them away. So the Double Stack is like a variation of the original. It's easy to make for us, and it's easy to just have a lot of stuff in-house, so everyone leaves happy. Suzy Chase: The combo of the LaFrieda beef with the pretzel bun, and the Emmy sauce, and the bread-and-butter pickles, and the cheese was incredible. Matt Hyland: Yeah. And again, it's really just some interesting ingredients. I mean, the Emmy sauce is the Korean wing sauce with some aioli in it. So it's almost like a Korean gochujang sauce, like on the dry-aged beef. So it's, again, a lot of things that you might not think go well together. But when you think about it culinarily, you know, it's like these flavors do go well together. And the pickles kind of cut through all the richness of the dry-aged beef. And you know, if you think about a burger as like an actual dish, it's easier to kind of create a better-tasting burger than just like, "Okay. What comes on a burger?" It's like, "All right. It's lettuce, tomato, onions." You know, like, who cares? Like, put some thought into it, and put some ... Just like, it needs more acid. It needs more this. It needs more ... You know, if you think about an actual dish, I mean, it's not that hard to make a really good burger. Suzy Chase: Okay. So for dessert, we went over the top, and we got the S'moresby, your deconstructed s'mores. That pushed us over the edge. Matt Hyland: Yeah. I like that one, too. We were doing a s'mores calzone for so long, so it's kind of a tradition to just have a s'mores dish on the menu. I mean, yeah, who doesn't love s'mores? I mean, it's chocolate, marshmallow, and graham crackers. It's a great combo. Suzy Chase: It's pretty, too. Matt Hyland: Yeah. It's really nice looking, too. Suzy Chase: So I was looking around the restaurant, which was packed, by the way, at 5:00 on a Saturday, and it was so interesting to see. Everyone ordered a hamburger and a pizza or two. Matt Hyland: Like I said, with the burger, I mean, it's just had such notoriety. And like, we just put so much work into making it delicious, that I think that, you know, I joke that we opened a pizza place, but we're actually secretly a burger restaurant, you know? I'd say the burger's the most successful special ever run. You know, so it was a special, and then goes on the menu. And then, you know, we don't really mention the burger that much when it comes to the branding of it, but it's there, and people love it. And like, I'm glad, in the West Village, we do have the space to make sure everyone gets one. Suzy Chase: Now, for my segment called "My Last Meal." What would you choose for your last supper? Matt Hyland: Oh, I'd definitely go get dim sum, lots of different, little dumplings, things like that. I like to ... I mean, dumplings are definitely my favorite food, even though you'd probably guess pizza was. But dumplings are something I grew up eating a lot of. I love dumplings. I go to Mimi Cheng's Dumplings all the time. I think they have great dumplings. Or you know, I'll go to like a dim sum place, and it's got a little variety of all kinds of things in wrappers, you know? That would definitely be my last meal. Suzy Chase: So you'd get all dumplings? Matt Hyland: All dumplings, that's it; different varieties, though, different varieties; not just one kind, just different varieties of dumplings. Suzy Chase: Where can we find your restaurants and you, on the web and social media? Matt Hyland: You can find our restaurants in Clinton Hill, Williamsburg, East Village, West Village, Nashville. And then we have a new one, called Violet, opening soon in the East Village as well, where we'll be going grilled pizza. You can find us on Instagram at PizzaLovesEmily, and www.PizzaLovesEmily.com. Suzy Chase: I didn't think this was possible, but you have elevated the good, old pizza and the good, old burger, and brought it to a whole new level. Thanks, Matt, for coming on Cookery by the Book podcast. Matt Hyland: Thanks for having me. Suzy Chase: Follow me on Instagram at CookeryByTheBook; Twitter is IAmSuzyChase. And download your Kitchen Mixtapes: Music To Cook By, on Spotify at Cookery by the Book. And as always, subscribe in Apple Podcasts.